The ship sailed from Miami April 21 to the shipyard in the Bahamas to begin a scheduled "Solsticizing" refurbishments. On the Millennium Class ships, you'll now be able to indulge in the spa-inspired AquaClass staterooms with exclusive dining in the Blu restaurant. Other additions include Qsine, and Celebrity iLounge. Celebrity Millennium leaves from Asian ports during the spring and fall seasons. She sails Alaska from Vancouver during the summer season. Activities for kids ages 3-17. Located on Sunrise deck. The Millennium-class ships have been introduced since the year 2000. 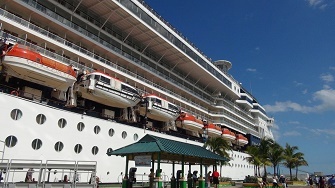 A favorite of many vacationers, Celebrity Millennium cruises Alaska, the Caribbean and the Panama Canal. Millennium features AquaClass® staterooms, the AquaClass signature restaurant, Blu, and the addition of verandas to her chic Celebrity Suites. Ocean View 175 Sq. ft.
Suite accommodations include butler service, personal computer, printer and internet service, personalized stationary, terry cloth robes in your stateroom during the cruise, priority check-in and debarkation, express luggage delivery, dining room seating preference and in-suite dining. Experience full service in-suite dining for all meals, complimentary daily in-suite espresso and cappuccino, afternoon canapés and tea. Suite guests indulge in extra amenities like oversized cotton towels, additional custom bath products, a massaging showerhead, and slippers. You can see the menus at the Celebrity Dining section of the Celebrity Cruises website – click on specialty dining and scroll down, you will see a list of restaurants on the Celebrity Millennium. Experience award-winning cuisine, superlative service, and stunning ocean views in a most refined dining atmosphere. Offering healthy and flavorful dishes next to the Aqua Spa. With a menu that features delicious, light, health-conscious fare, the AquaSpa Café is a great way to reward yourself any time of day or night. Qsine features savory tapas and mezze served individually in custom-made frames, a trio of chilled soups delivered shot-style, and spring rolls served in springs, all of which are described in detail on the iPad-housed menu and wine list, which offers a full scan of wine labels, an interactive cocktail menu, and the ability for guests to enter tasting notes and e-mail their favorite wine selections. $45 per person. The RS Olympic offers two menus options including a regular four course menu with typical gourmet selections, and the "Five Senses" menu, pairing different wines with a six course food selection. $45 per person. The Martini Bar offers 20 variations of martinis. Relax at the Riviera pool/Cafe/Grill, pamper yourself at the AquaSpa, complete with Persian Garden Turkish Saunas. Also includes the Fitness area.